The sudden announcement that Hugo Chavez's efforts to broker a hostage swap with Colombia's left-wing Farc rebel group were being halted was a clear indication the Colombian President had lost patience with his Venezuelan counterpart. 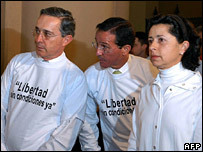 On Monday, Alvaro Uribe gave Mr Chavez less than a month-and-a-half to reach a deal. Two days later he ended his role as mediator. To some President Uribe, whose father was assassinated by the Farc in a 1983 kidnap attempt, was just waiting for an excuse to put a stop to Mr Chavez's efforts. To others, Mr Chavez acted clumsily. At the weekend, he revealed to the media details of a private discussion he had held with Mr Uribe on the hostage situation. He then made a high-profile visit to France to meet President Nicolas Sarkozy, who has been pushing for the release of the French-Colombian politician, Ingrid Betancourt. Ahead of the meeting in Paris, Mr Chavez had indicated that he hoped to bring evidence that Ms Betancourt was alive. But instead of the hoped-for proof, Mr Chavez said he had received a written assurance from the leader of the Farc, Manuel Marulanda, that such evidence would be forthcoming "before the end of the year". 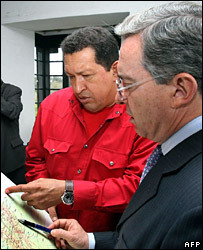 If President Uribe had any second thoughts about Mr Chavez's role as a mediator, his telephone conversation with the head of the Colombian army - after Mr Uribe had asked him not to speak to his generals - was the last straw. The Venezuelan leader has yet to respond to Mr Uribe's decision, but he is likely to repeat what he said earlier this week. "The present [Colombian] peace commissioner has been trying to reach a deal for five years. We've been at it for only three months and in that time we have advanced more than in five years. We need to be patient," he said. Indeed, anyone who has followed the Northern Ireland peace process knows that trying to solve a 40-year-old armed conflict in a few months sounds rather naive. But the bottom line is not whether Mr Chavez acted clumsily, or whether Mr Uribe was impatient, but rather a question of lack of trust and compromise. It is no secret that the Venezuelan and Colombian leaders are at opposite ends of the ideological spectrum. Colombia is Washington's biggest ally in the region and Venezuela, together with Cuba, its main opponent. The Colombian foreign minister, Fernando Araujo, who was held hostage by the Farc for six years, once said that the rebels see Mr Chavez as one of their "ideological leaders" and an "inspiration". 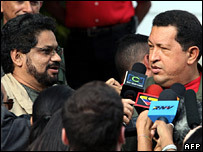 He stopped short of accusing Mr Chavez of being directly involved in the insurgency, but his remarks revealed how deep the rebels identify with the man who was until recently attempting to negotiate a peace deal. But the biggest obstacle to peace is that the Colombian government and the rebels cannot find a middle ground. In August, Mr Uribe said he was willing to create a safe-zone for a period of 90 days in which Farc and government delegates could meet. He also promised to release all Farc prisoners who vowed not take up arms again. In return, he demanded the rebels freed all their hostages. The Farc response was short and to the point. "It is clear now that there will not be a humanitarian exchange with Mr Uribe's government," it said. The Farc wants a demilitarized-zone, which is different from a safe-zone, and they want their prisoners freed without any conditions. It is too soon to say whether Mr Chavez's end as a mediator means that the peace process has also finished. Perhaps it would be wiser to ask whether the peace process ever started at all.